Lucky Leprechaun online slot game is back and is gracing you with his magical presence for a game that is sure to break the boundaries of its genre. As you may have guessed this 5 reel slot game adopts the age-old Irish theme and transports us to a serene meadow on the Emerald Isle alongside a gameboard filled with four leafed clovers and other Irish symbolism. Here we have another game from iSoftBet that really offers a stand out example of what they’re capable of. Perhaps it could be argued that the Irish theme has become a hackneyed genre but the Lucky Leprechaun certainly offers a new spin on things. iSoftBet have a broad repertoire of games that span the simplest of slots to big budget, immersive and cinematic branded slot games. More recently, they’ve brought out a game that’s based on the Paranormal Activity horror movie franchise. Embark on a journey into the Galway heartlands and meet the Lucky Leprechaun, the small and friendly ginger creature who is here to guide you on your quest for free spin riches and cash rewards. He can’t tell how to play, but what he can do is offer his reassuring assistance as he purveys your every move at the side of the reel. Predictably, the general colour scheme of this game is green and features a wooden gameboard that sits ahead of an idyllic countryside meadow that really puts you at ease and creates a relaxing atmosphere. For any players playing with sound you will be greeted with the sound of a xylophone which creates a slightly wacky atmosphere which really couples up well with the leprechaun connotations. Lucky Leprechaun slot has 5 reels, and 30 paylines that can be bet upon on a range of sliding betting structures. The highest paying symbol in the game is the elusive four leaf clover. The amazing thing about this symbol is that if you match five of these babies in a row then you will win a HUGE cash prize. The WILD SYMBOL of this slot game is the GOLDEN COIN and can be substituted or transferred for any symbol on the reels apart from the LEPRECHAUN and POT OF GOLD symbol. GAMBLE FEATURE - A great feature of this game is that the fun isn’t over once you’ve win. Following each win and spin you will be offered to take part in this game’s unique GAMBLE feature. Another unique aspect of the gamble feature is that you can set your own odds and adjusts the risk of your gamble to create an 8x multiplier of your original prize money. This isn’t a feature for the faint hearted but if you’re looking to play with the big boys and earn some sweet Irish cash then you can Gamble your winnings up to 3 times. FREE SPINS ROUND – The free spins round can be accessed by locating the LUCKY LEPRECHAUN symbol. Once you’ve reached the hallowed ground of this round you will be greeted with 9 boxes. Inside these 9 boxes are varying amounts of free spins that can be chosen to receive a prize. Additionally, you will then be asked to pick from 3 hats, this element decides how much your free spins will be multiplied by. Finally, any spins throughout this round will be juiced up by the STICKY WILD, meaning better winlines can be formed. BONUS ROUND – This round can be activated by locating the SCATTER symbol; the pot of gold. 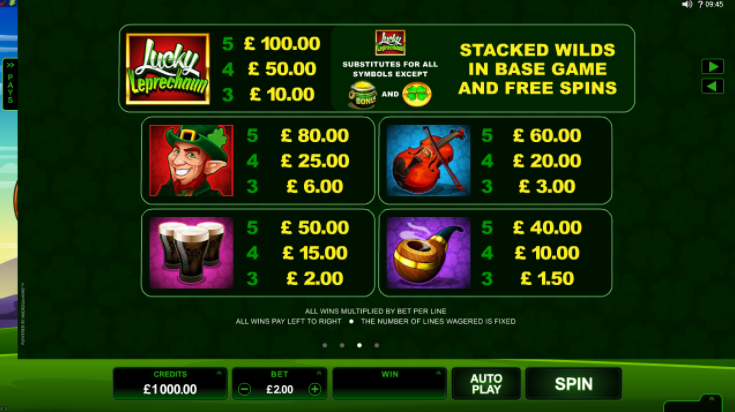 Following this you will see a game page that shows the mischievous leprechaun standing next to three pots, each representing a different amount of cash that you can win. You can only enter this jackpot round however, if you’re playing on the max betting structure. Lucky Leprechaun certainly is one of the best slot games out there to tackle the Irish theme over at Wizard Slots. Many have tried but many have fallen short of the mark. Lucky Leprechaun is a great addition to the platform from the developers, iSoftBet and certainly creates a benchmark for other games of the same ilk. If you’re looking for an easy-going Irish slot game filled with Leprechauns and four leafed clovers then this is the game for you. Alternatively, if you’re interested in other Irish themed games at Wizard Slots, then why not try Irish Eyes.